Boland Stud are proud to offer a ¾ brother to a Singapore Gr.1 winner at the 2018 Emperors Palace National Yearling Sale. 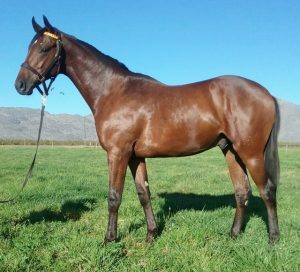 This bay colt, catalogued as lot 99, is from the very first crop of Equus Champion Vercingetorix, one of 20 Gr.1 winners sired by champion sire Silvano. 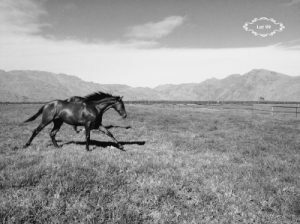 Vercingetorix, an unbeaten Gr.1 winner in South Africa, excelled when exported to Dubai. The handsome colt won both Dubai’s Gr.1 Jebel Hatta and Gr.2 Al Rashidiya and ran a storming second, behind the then world’s top rated runner Just A Way, in the 2014 Gr.1 Dubai Duty Free. Vercingetorix has already had yearlings from his first crop make up to R625 000 in 2018. Like outstanding sire Dynasty, the Mike de Kock trained Vercingetorix won both the Gr.1 Daily News 2000 and Gr.2 KZN Guineas. 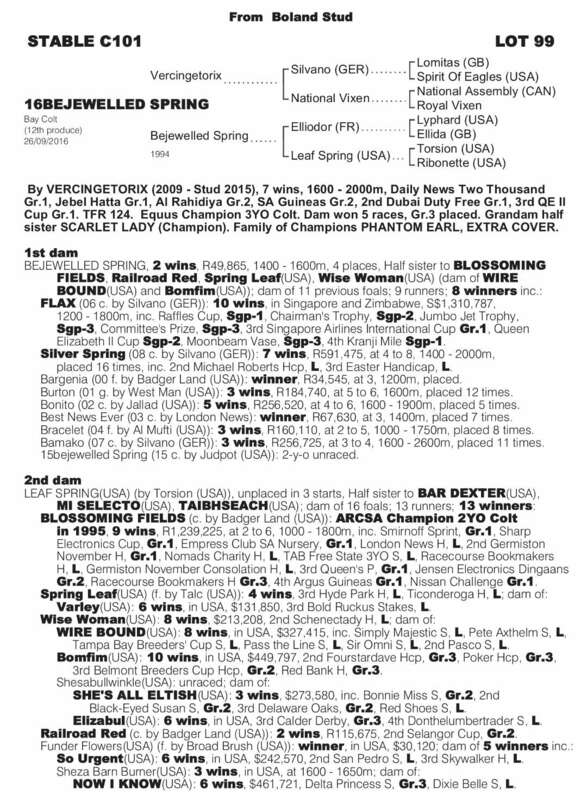 His son, out of the Elliodor mare Bejewelled Spring, is a ¾ brother to two high class performers in the form of Flax and Silver Spring (both of whom were sired by Vercingetorix’s very own sire Silvano). Flax, who raced for Newbury Racing, did South Africa proud in Singapore where he won nine races, including the Sgp1 Raffles Cup and Sgp2 Chairman’s Trophy. The classy gelding also ran third in the 2012 Gr.1 Singapore Airlines International Cup behind multiple Gr.1 winner Chinchon. Flax’s own brother Silver Spring was also talented, winning seven races in South Africa and finishing second, to subsequent Gr.2 winner Ten Gun Salute, in the 2016 Listed Michael Roberts Handicap. The remarkable Bejewelled Spring, a winning half-sister to Equus Champion and multiple Gr.1 winner Blossoming Fields, has a grand total of eight winners, from nine runners, to her name. Progeny of Bejewelled Spring have won a total of 33 races (at the time of writing)! 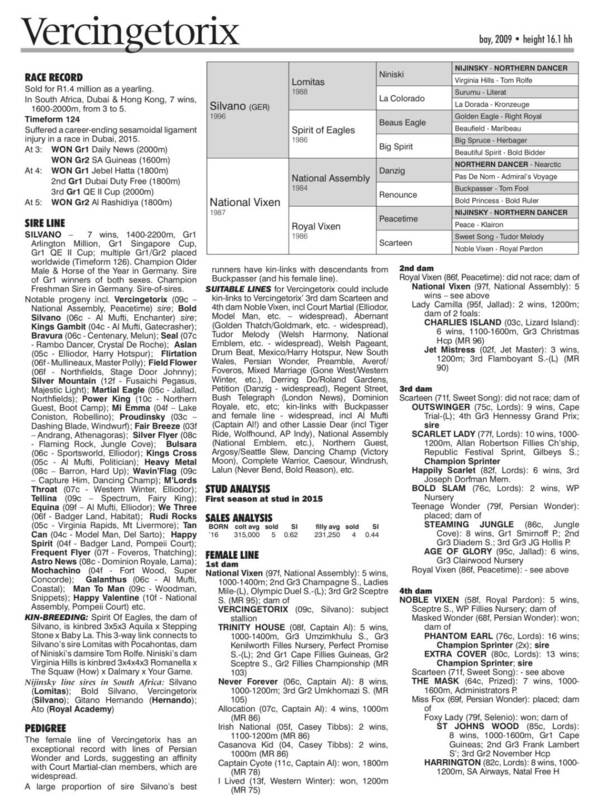 Her sire Elliodor is a superb damsire, with Elliodor featuring as the broodmare sire of over 80 stakes winners, headed by Gr.1 winners/champions Abashiri, Chestnuts N Pearls, Cordocelli, Dog Wood, Donatella, French Navy and brilliant sprinter Val De Ra. (He is also damsire of promising young stallion Master Of My Fate). Silvano has done well when mated to Elliodor mares (the mating having produced the Sean Tarry trained multiple Gr.1 winner and champion Aslan as well as Gr.2 winner Ice Machine), and there is no reason to think that Vercingetorix won’t enjoy similar success!